How brands can use four advertising features on Instagram to increase sales and engagement. As Facebook turns 15 today, it reminded me of a story a few years back. “It’s only for teenagers and students, not people serious about booking travel”, he would say. He would always finish with, “We’ll stick with the ads in the Sunday press as they never fail”. When I met him again a few years later, he mentioned quite a lot had changed. This type of unfortunate and misinformed approach still prevails to this day. There is a blind faith and loyalty in keeping with tradition even though this can work well, in isolation without the right measurement or intent, the results are flat at best. Using the filter X-PRO 2, Kevin Systrom took a picture of a dog in Mexico near a taco stand. This was the one of the first Instagram photos ever taken. Kevin was CEO and co-founder of Instagram, the year was 2010. A lot has happened since that picture. In 2012 Kevin sold his 13 man start-up to Mark Zuckerberg of Facebook for $1bn, of which $300m was paid in cash and the rest in Facebook stock. Kevin is still on Instagram @kevin and has 7.9m followers. Though still the go to place for celebrity gossip and to show off daring and exotic holidays and enviable breakfasts (avocado on toast, anyone? ), one of the most significant changes over the last five years, has been the adoption of Instagram by business. In what was initially seen as an odd pairing to begin with, it is now part of any core digital marketing strategy and one that still garners resistance in certain quarters. As with all good marketing, the numbers don’t lie. 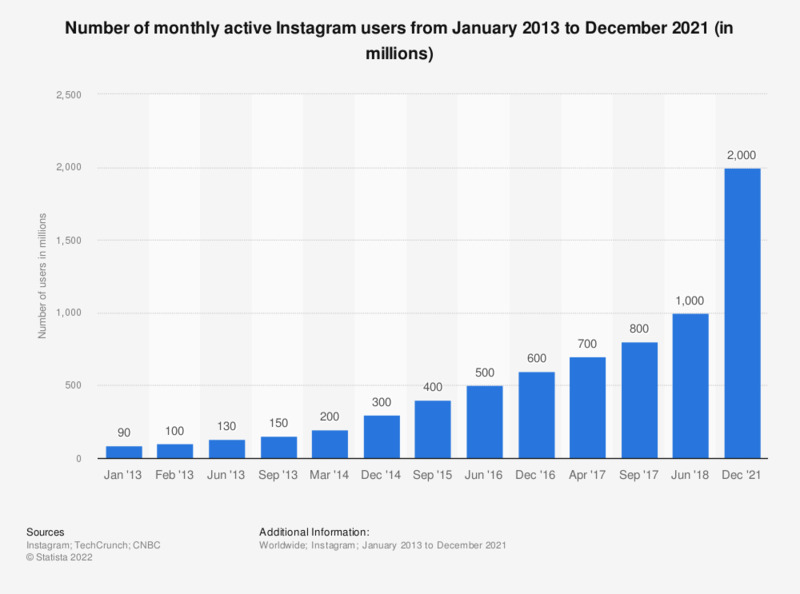 According to Instagram’s own internal data, between 2017 and 2018 the figures are quite staggering. It is a truth universally acknowledged, that a business with money is in want of customers (sorry Jane Austen). This desire for customers, especially by big business, normally falls flat and certainly did so in the early days as big multinationals tried to get down with the kids – failing miserably along the way. Springboard to 2019 and the world is a different place. Many social media channels are aggressively commoditised. Though carrying increasing levels of advertising, Instagram somehow is currently bucking the trend. With new features that lend themselves to creativity as opposed to mass advertising saturation, the opportunity for business to engage has never been brighter. This fact alone, makes Instagram a platform that business must embrace. Unlike many others, it allows for sincerity and deep positive sentiment. One big factor that is making Instagram the behemoth for marketing dollars, is that the clever people that work there are continually refining the platform and releasing new features. Nine years on from Kevin’s first post, there are a raft of different features that are keeping both users, consumers and business alike, coming back for more. So strong is this magnetism that for many, Instagram is the go to platform of choice first thing in the morning prior to reading work emails or messages. In a separate post, I will look at how companies can increase eCommerce sales on Instagram but for now, let’s look at the basics to get you started. Instagram has four main advertising platforms. These are aligned with their current organic offering that users access for free everyday to post everything from their holiday snaps to motivational words of wisdom. The key difference with the ad platforms (other than the cost), is the ability to target. The organic posts in your feed are only seen by your followers or those searching on a specific hashtag. This has become increasingly challenging now since Instagram changed its algorithm. The change to the algorithm means that sometimes you may see posts from people you follow a lot later than previously, sometimes it can be 12-20 hours or longer till you come across a post. The simplest and easiest way to start advertising on Instagram. Photo ads are a clean and effective way to raise your profile and reach your target audience. Photo ads are available in square and landscape format and allow you to showcase your products or service through a creative photo and message, in a similar format to an organic post. Get the same visually immersive quality as photo ads, with the added power of sight, sound and motion. And now, you can share videos that are up to 60 seconds long in landscape or square format. By adding multiple pictures to the normal portrait picture, turns the post into a carousel. Adds another layer of depth to campaigns, where people can swipe to view additional photos or videos in a single ad. Instagram Stories is another way for you to tap into people’s passions and inspire them to take action. In fact, of the 400 million accounts using Instagram Stories, one third of the most-viewed stories come from businesses, and one in five stories gets a direct message from its viewers. Target users by specific locations such as counties, regions, cities or countries. Pinpoint your targeting based on information such as language, gender and age. Reach people based on accounts they may have clicked on or accounts they follow. Target by activities on Instagram and Facebook. Run ads to existing customers based on their email addresses or phone numbers. Target those who are similar to your current customers. Instagram uses signals to start creating profiles of those interested in your business by using location, demographics and interests. Instagram has come a long way from that picture of a dog posted back in 2010 by Kevin Systrom. It has taken the marketing world by storm and though it seems new, is actually 9 years old. In internet currency, that’s an established player. Like Google Ads and Facebook Ads before it, the time to use the platform is now as it is relatively cost effective – unlike the previous two that have become far more expensive but remain equally important and relevant. There is a temptation to think that creative ads will deliver clicks and sales – the reality is somewhat different as you are competing for bandwidth with hundreds of thousands of other advertisers all using different platforms, all trying to reach that same individual. Like any platform, the proof in the pudding is actually using it, looking at the analytics and sales data and reapplying learning. As the Facebook owned company keeps looking at new opportunities to stay relevant and increase revenues, the platform could well be the saviour of Facebook but also one of the best marketing avenues for you to start benefiting from today.